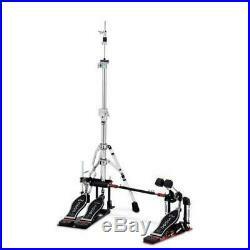 Drum Workshop 55202 Double Pedal Hi Hat Stand. The 5520-2 is a complete double pedal hi-hat package. This design allows the auxiliary side of the double pedal to be on the outside of the hi-hat. The pedal can easily be converted into a 5520 when using a single pedal. The new Lateral Cymbal Seat Adjustment utilizes a specially made nylon insert wing nut for easily adjusting the angle of the bottom cymbal, even while playing. Integrated Memory Locks on all tube joints guarantee 100% repeatable precise height settings every time. Swivel Legs allow easy positioning of bass drum pedals and other stands around the Hi-Hat Stand. SM379 Locking Clutch is standard on all 5000 Series Hi-Hat Stands. Upper rods come standard in two lengths with all 5000 models, allowing you to customize the Hi-Hat Stand for your specific needs. We stand by the products we sell, and we’ll certainly stand by you as well! Sam Ash is not responsible for any damage caused by not adhering to the voltage requirements. We strongly suggest that you check your order after receiving it to be sure that it is in proper working order. Resalable Condition means that the product(s) is exactly in the same condition as you received it. Please call our Customer Service department if you have any questions about returning an item. The item “Drum Workshop 55202 Double Pedal Hi Hat Stand” is in sale since Thursday, February 7, 2019. This item is in the category “Musical Instruments & Gear\Percussion\Parts & Accessories\Stands”. The seller is “samashdirect” and is located in Tampa, FL. This item can be shipped to United States.